From a game between two 4D on KGS. Among the spectators, the question arose of how to respond to White a. Is a response necessary? If so, where should Black respond. Dieter: Yes, Black should respond, and b suffices. The question for me is if c is also possible. Velobici: During the game one suggestion was W a, Black d, White b, Black e.
Dave: You mean 1 - 4 here? Then threatens a double atari at a. prevents this but is then seki. 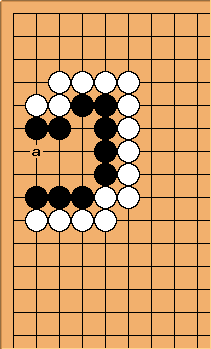 Note that if Black plays 6 at a, kills Black. Velobici: Indeed, the seki was one of the proposed results of the position in the kibitz discussion during the game.